We will cover both the physical (hydrogeomorphic) and ecological feedbacks of beaver dams. We need to understand the feedbacks and ecosystem services provided by beaver dams in order to develop appropriate restoration and conservation objectives around these. 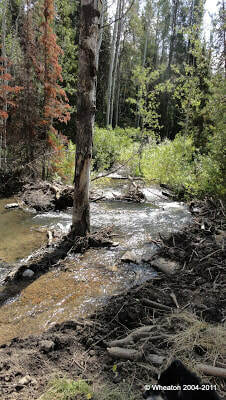 Breached beaver dam near the Idaho/Utah border on Beaver Creek. Fouty, S. 2003. Current and historic stream channel response to changes in cattle and elk grazing pressure and beaver activity. Ph.D. dissertation, University of Oregon, Department of Geography. Butler D and Malanson G. 2005. The geomorphic influences of beaver dams and failures of beaver dams. Geomorphology. 71(1-2): 48-60. DOI: 10.1016/j.geomorph.2004.08.016. 2011. Nyssen J, Pontzeele J and Billi P. Effect of beaver dams on the hydrology of small mountain streams: Example from the Chevral in the Ourthe Orientale basin, Ardennes, Belgium. Journal of Hydrology. 402(1-2): 92-102. DOI: 10.1016/j.jhydrol.2011.03.008. Denney RN. 1952. A summary of North American beaver management, 1946-1948, 28. Colorado Game and Fish Dept. Haarberg O and Rosell F. 2006. Selective foraging on woody plant species by the Eurasian beaver (Castor fiber) in Telemark, Norway. Journal of Zoology. 270(2): 201-208. DOI: 10.1111/J.1469-7998.2006.00142.X. Harrison, A.M., J.C. Stella. 2010. Engineering the forest ecosystem: impacts on woody vegetation structure and composition by beaver, a central place forager. Meeting of the Ecological Society of America, Pittsburgh, PA.
Keeton WS, Kraft CE and Warren DR. 2007. Mature and old-growth riparian forests: structure, dynamics, and effects on Adirondack stream habitats. Ecological Applications. 17(3): 852-868. Naiman RJ, Decamps H and McClain ME. 2005. Riparia: ecology, conservation, and management of streamside communities. Academic Press. Benke, A. C. 1993. Concepts and patterns of invertebrate production in running waters. Vehr. Int. Verein. Limnol. 25:15-38. Burchsted, D., M. Daniels, R. Thorson, and J. Vokoun. 2010. The River Discontinuum: Applying Beaver Modifications to Baseline Conditions for Restoration of Forested Headwaters. Bioscience 60:908-922. Hanson, P., T. Johnson, J. Kitchell, and D. E. Schindler. 1997. Fish bioenergetics 3.0. University of Wisconsin Sea Grant Institute, Madison, Wisconsin. Lindstrom, J. W. and W. A. Hubert. 2004. Ice processes affect habitat use and movements of adult cutthroat trout and brook trout in a Wyoming foothills stream. North American Journal of Fisheries Management 24:1341-1352. Mcrae, G. and C. J. Edwards. 1994. Thermal-Characteristics of Wisconsin Headwater Streams Occupied by Beaver - Implications for Brook Trout Habitat. Transactions of the American Fisheries Society 123:641-656. Meentemeyer, R. K. and D. R. Butler. 1999. Hydrogeomorphic effects of beaver dams in Glacier National Park, Montana. Physical Geography 20:436-446. Naiman, R. J., C.A. Johnston and J.C. Kelley.1988. Alteration of North American streams by beaver. . BioScience 38:753-763. filed under BioScience. Naiman, R. J., J. M. Melillo, and J. E. Hobbie. 1986. Ecosystem Alteration of Boreal Forest Streams by Beaver (Castor-Canadensis). Ecology 67:1254-1269. Pollock, M. M., G. R. Pess, and T. J. Beechie. 2004. The importance of beaver ponds to coho salmon production in the Stillaguamish River basin, Washington, USA. North American Journal of Fisheries Management 24:749-760. Poole, G. C. 2002. Fluvial landscape ecology: addressing uniqueness within the river discontinuum. Freshwater Biology 47:641-660. Sigourney, D. B., B. H. Letcher, and R. A. Cunjak. 2006. Influence of beaver activity on summer growth and condition of age-2 atlantic salmon parr. Transactions of the American Fisheries Society 135:1068-1075. Snodgrass, J. W. 1997. Temporal and spatial dynamics of beaver-created patches as influenced by management practices in a south-eastern North American landscape. Journal of Applied Ecology 34:1043-1056. Snodgrass, J. W. and G. K. Meffe. 1998. Influence of beavers on stream fish assemblages: Effects of pond age and watershed position. Ecology 79:928-942. Vannote, R. L., G. W. Minshall, K. W. Cummins, J. R. Sedell, and C. E. Cushing. 1980. The river continuum concept. Can. J. Fish. and Aquat. Sci. 37:130-137. Mateusz Ciechanowski M., Kubic, W., Rynkiewicz, A. & A. Zwolicki. 2010. Reintroduction of beavers Castor fiber may improve habitat quality for vespertilionid bats foraging in small river valleys. Eur. J. Wild. Res. Johnston CA and Naiman RJ. 1990. Aquatic Patch Creation in Relation to Beaver Population Trends. Ecology. 71(4): 1617-1621. Retzer JL. 1956. Suitability of physical factors for beaver management in the Rocky Mountains of Colorado. State of Colorado Dept. of Game and Fish.